Some museums have sets of periodicals, technical manuals, photographs and personal archives. These are often made available to aviation researchers for use in writing articles or books or to aircraft restoration specialists working on restoring an aircraft. 20 best aviation museums around the world - CNN travel. Air Museums - Aerofiles. Museums and Public Access Displays of North America. Aviation museums - Thirty Thousand Feed. Aviation Directory. Aviation museums of the world - "1,255 aviation museums on this website." List of aerospace museums - Wikipedia. Top Aircraft Museums in the United States - Pacific Warbirds. Warbird Aircraft Museums - Warbird Alley. Auto & Technik MUSEUM SINSHEIM - "We have two fully accessible supersonic jets for you, the Concorde and Tupolev TU-144, located on the museum roof." Aviodrome - large aerospace museum in the Netherlands that has been located on Lelystad Airport since 2003. Brooklands Museum - "The Birthplace of British Motorsport and Aviation, Home of Concorde." Weybridge, Surrey, England, U.K.
Canada Aviation and Space Museum - Canada's national aviation history museum. The museum is located in Ottawa, Ontario, Canada, at the Ottawa/Rockcliffe Airport. Central Air Force Museum - housed at Monino Airfield, 40 km east of Moscow, Russia, is one of the world's largest aviation museums, and the largest for Russian aircraft. 173 aircraft and 127 aircraft engines are on display, and the museum also features collections of weapons, instruments, uniforms (including captured U2 pilot Gary Powers' uniform), other Cold War-era US spy equipment, artwork, and other air-related items. Chinese Aviation Museum - aviation museum close to Beijing in China. The museum was first opened to the public on 11 November 1989, to celebrate the 40th anniversary of the founding of the People's Liberation Army Air Force. Future of Flight Aviation Center & Boeing Tour - aviation museum and education center located at the northwest corner of Paine Field in Mukilteo, Washington. It is the starting point for the Boeing Tour, a tour of a portion of Boeing's Everett, Washington production facility in which the models 747, 767, 777 and 787 are built. Hangar-7 - owned by Red Bull founder Dietrich Mateschitz is not a hangar in a traditional sense but rather a multifunctional building with a collection of 25 historical airplanes, helicopters and Formula One racing cars. It houses a restaurant, two bars, a lounge and aircraft, and is open to the public. It includes the Michelin starred restaurant Ikarus. Salzburg, Austria. Imperial War Museum Duxford - branch of the Imperial War Museum near Duxford in Cambridgeshire, England. Britain's largest aviation museum, Duxford houses the museum's large exhibits, including nearly 200 aircraft, military vehicles, artillery and minor naval vessels in seven main exhibition buildings. The site also provides storage space for the museum's other collections of material such as film, photographs, documents, books and artefacts. National Museum of the United States Air Force - the official museum of the United States Air Force located at Wright-Patterson Air Force Base, 6 miles (9.7 km) northeast of Dayton, Ohio. The NMUSAF has one of the world's largest collections with more than 360 aircraft and missiles on display. Palm Springs Air Museum - non-profit educational institution in Palm Springs, Riverside County, California. The Museum's mission is to exhibit, educate and eternalize the role of the World War II combat aircraft and the role the pilots and American citizens had in winning the war. It contains one of the world's largest collections of flying World War II warplanes, many of which were built in Southern California. Pima Air & Space Museum - located in Tucson, Arizona, is one of the world's largest non-government funded aerospace museums. The museum features a display of nearly 300 aircraft spread out over 80 acres (320,000 m2) on a campus occupying 127 acres (610,000 m2). Polish Aviation Museum - arge museum of old aircraft and aircraft engines in Kraków, Poland. 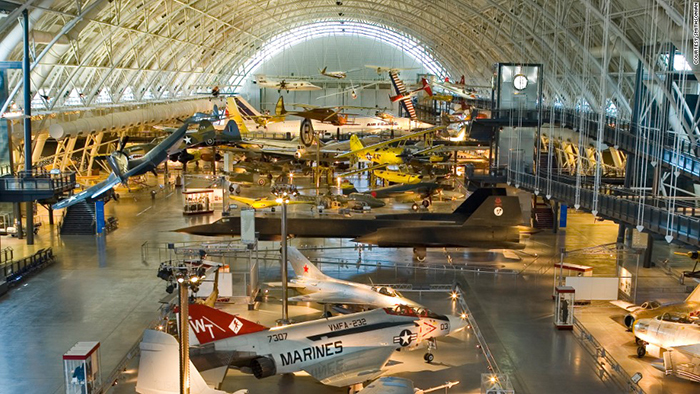 Has been scored as eighth world's best aviation museum by CNN television. Royal Flying Doctor Service Museum - you can discover what it's like to be inside one of our aircraft and look inside a replica fuselage of a Pilatus PC12. Alice Springs, Australia. Smithsonian National Air and Space Museum - holds the largest collection of historic aircraft and spacecraft in the world in 161,145 square feet (14,970.9 m2) of exhibition floor space. It was established in 1946, as the National Air Museum and opened its main building near L'Enfant Plaza in 1976. In 2014, the museum saw approximately 6.7 million visitors, making it the 5th most visited museum in the world. 600 Independence Ave SW, Washington, DC 20560, U.S.A.
Ukraine State Aviation Museum - aviation museum located next to Zhulyany Airport in Kiev, Ukraine. The museum offers both aircraft exhibits and also interactive displays. The museum is one of the larger aviation museums displaying Soviet technology.